The strawberries survived the slapdash planting they received (and the above average heat we've been having), and are putting out flowers. Maybe - just maybe - I'll have some June berries! In other events around the farm, we've planted another apple, two pear, two nectarine, another peach, two cherry, and two almond trees. Left to go: two more cherries, two white mulberries, two elderberry bushes, and two pomegranates. I've also a bunch of blackberry canes (a wonderful trade with Joy, for goose & duck eggs) and grape vines awaiting their support structure to be built (*ahem*). Oh, and some good old-fashioned rugosa roses, for their vitamin-C packed seed hips. There has been some non-food planting going on as well. I've given up trying to get healthy blackberries and grapes to grow in the southwest-facing garden beds in front of the house. The garden beds abut a three-foot high concrete foundation (the house is on the side of a hill), and it gets too danged hot in the Summer. I'll leave the current scraggly vines and canes in place for now, but in the meantime have planted another variegated privet (to match the mature one on the other side of the steps), two "Sangria" esperanzas, and will put in some "Dallas Red" lantana flowers under the esperanzas - all perennials, and all adapted or native to this area. On the northwest side of the house, the Japanese barberry bushes just couldn't cut the combination of Winter's bite and the constant nagging at their roots by the chickens, so I've planted a couple of Texas Sage bushes in their place to match the single Texas Sage in the same garden bed. The dang thing is bullet-proof - geese, dogs or chickens, nothing bothers it. 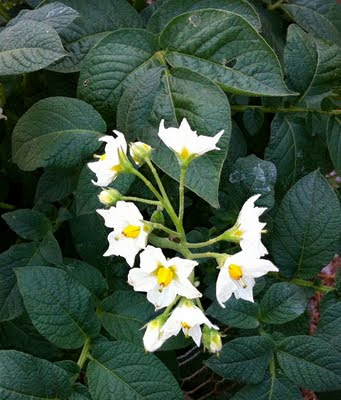 These photos were taken on March 31st, and the potato greens are now a good couple inches above the tower tops! 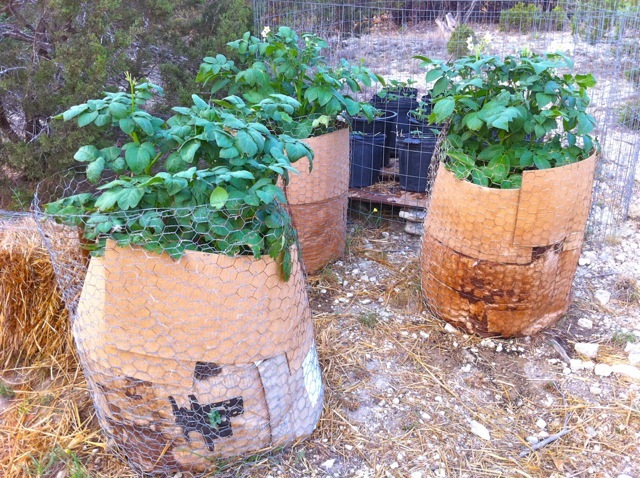 I ran out of home-made compost, and had to buy a couple bags to continue filling the towers. Not sure if I'll do a pure compost potato tower next year. 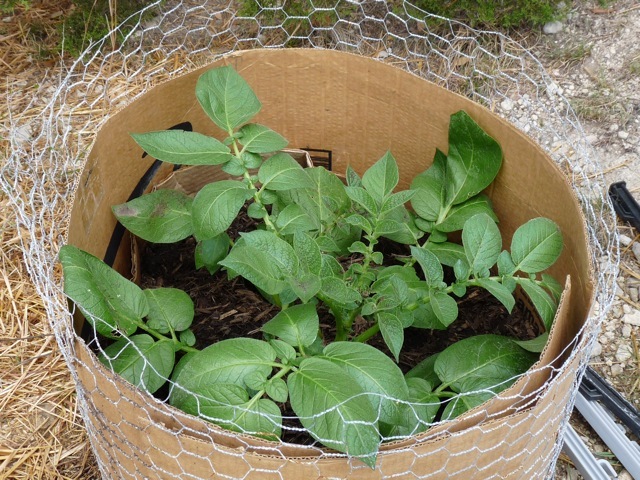 I realize potatoes can be heavy feeders, but thinking maybe a half-and-half mix of good soil & compost might do just as well. 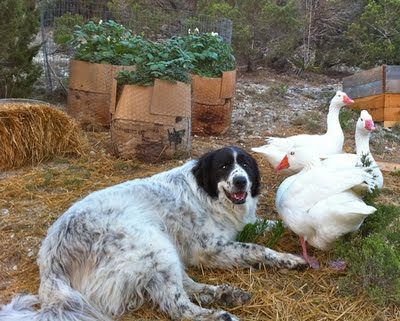 Miracles upon miracles, the chickens have stayed out of the towers so far, and the geese have not destroyed the potato leaves. I also (finally!) received the order of low-chill cherry and white mulberry trees. I'll write more about those later, but with that order came 50 (yes, 50!) FREE bare-root strawberry plants, which I had totally forgotten about. Eep! 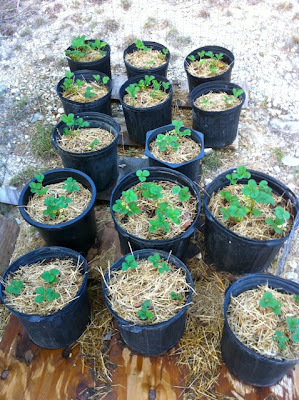 The raised beds hadn't been filled with the custom soil mix yet, and I needed to get those strawberries planted ASAP. I grabbed a bunch of three- and five-gallon recycled plastic plant pots, filled them with a robust potting soil, and covered with well rotted (and poo'd upon) straw and hay for insulation and moisture retention. Good thing the straw was there, as we had an unexpected freeze just a few days ago. The berries (and potatoes) survived just fine, probably with a radiant-heat assist from the slope they're on, which faces southwest. The last average freeze here is March 15th, but some veggie gardeners won't put anything into the ground until after Easter. 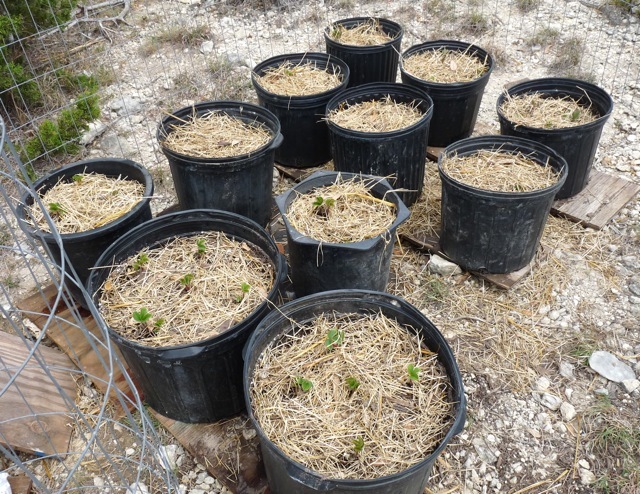 In the picture below, about two-thirds of the strawberries are potted - there's even more pots on the ground now. The wooden boards you see below the pots are to keep the pots level for watering. 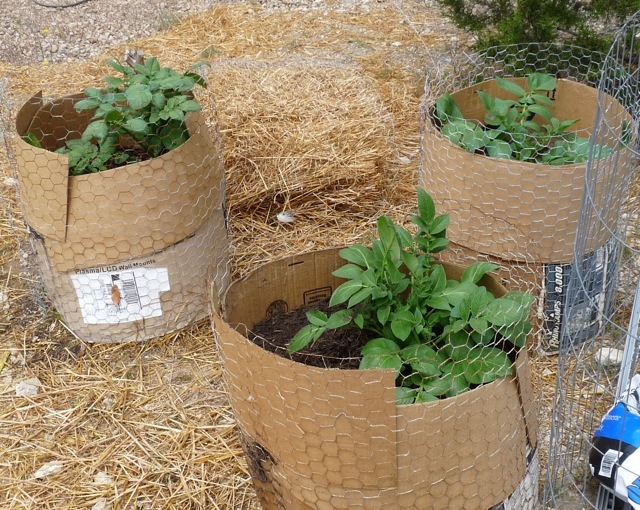 The three-gallon pots have three strawberry plants in each, and the five-gallon have four or five plants each. I don't even know what kinds of strawberries these are; I'm guessing annuals of some sort. This is the first time I've planted strawberries, and doing so in containers is another grand experiment. Hoping this works out - it would be so lovely to have fresh berries for eating and jam this year, and right from my own back yard!